Has your computer been running slow lately? Are you getting a bunch of unwanted pop-ups? Then it’s possible your system’s security has been breached. 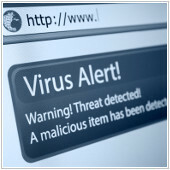 Being able to identify whether or not your computer is infected with malware will allow you to quickly come up with antivirus solutions to protect your system. This means you’ll be saving time and money from doing a fresh reinstall of your operating system. Here is a list of possible symptoms you may encounter if your computer has a malware infection. https://www.outsourceitcorp.com/wp-content/uploads/2016/03/2016Mar29_Security_B_PH.jpg 300 900 OutsourceIT /wp-content/themes/tridigital/SVG/logo.svg OutsourceIT2016-03-29 20:00:322016-03-29 20:00:32Is your computer infected with malware?